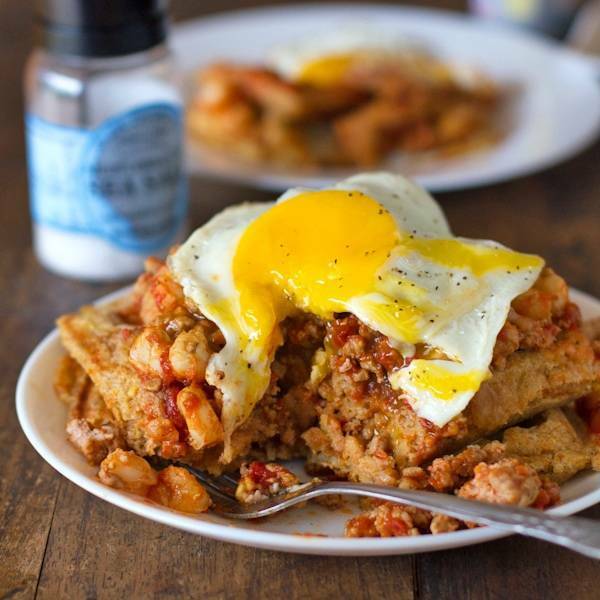 Let’s get messy today with a runny egg yolk over spicy chili and a sweet cornbread waffle. Yeah? I won’t even judge if you if you have eggs yolks running down your chin and chili drippings on your shirt. Can I be honest with you? I am a total sugar-lover, so savory waffles are extremely out of the box for me. But then I found out that I lovvvve these, a lot. Syrup and whipped cream, I’ll come back for you around midnight. This whole savory waffle shenanigan started with an overabundance of my favorite soup ever – posole. This posole is a super easy to make Mexican hominy-based stew with pork sausage in it. Because I love pork. But you can use regular chili, because it’s the chili time of year. Now let’s talk about golden fluffy cornbread waffles. Cornbread waffles happen when I realize that I don’t love multigrain waffles. I mean, I don’t want to be a waffle discriminator, but just leave out the flax and add the cornmeal and sugar. That’s how it goes for me and my waffle maker. One lesson I’ve learned in the last five years is that fried eggs on top of things is basically the same thing as happiness. Speaking of eggs, have I told you about how the eggs here in the Philippines are not refrigerated? Usually I refrigerate them before using them, like a true Type A American. Buuuut the other day I actually used an egg from straight off the shelf. Like, it was warm. Because off the shelf here means it’s been sitting in 1,000 degree heat all day. Nothing crazy happened, but it was weird and I don’t really want to talk about it anymore. I think I like refrigerated eggs better. Please keep the yolk soft. It’s pretty and it tastes dreamy. At this point in my savory waffle pilgrimage, I was about to shove the first drippy bite into my mouth. Load the fork, bring bite to mouth, glance out the window. And there he was, watching me feed my face a fried egg waffle. He was joined by about five kids ranging from toddler to late elementary, all watching me through the open front door. I’m pretty sure I’ve been promoted to the status of Strange Neighbor Who Takes Pictures of Food. But all in the name of savory cornbread waffles topped with chili and fried egg. A worthy cause, for sure. These chili and cornbread waffle stacks start with a plate of delicious cornbread waffles, topped with chili and a fried egg. YUM. Mix flours, cornmeal, baking soda, baking powder, sugar and salt in a mixing bowl. Add egg, buttermilk, and oil and whisk until just combined. If batter seems too thick, add a tablespoon or more of buttermilk. Heat a waffle iron and pour batter onto hot griddles. Cook until waffles are lightly crispy and golden brown on the outside. Keep in a warm oven until ready to serve. 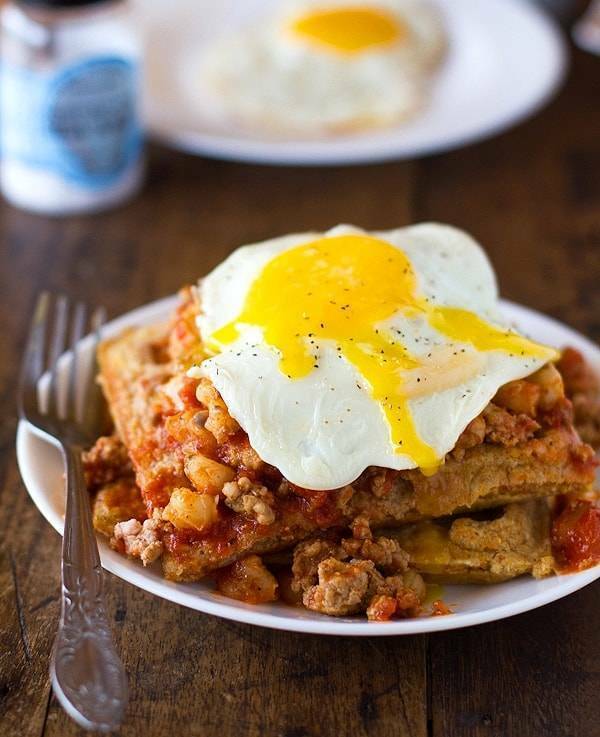 Stack waffles on a plate and top with a scoop of chili and a fried egg. Someone is frying bacon. I can smell it. If it’s you, I love you. that takes people to a video. One of the techniques implemented is to web link poor page to powerful webpages so that the back-link assistance works through organization of a particular website. it user-generated, it is also user-changed. Rice porridge and cakes are my favorite dish. You cook well. I appreciate your workmanship.